Over the past two years I have spent a lot more time than I ever have before in cemeteries. It is not that I was afraid before. I actually find them a beautiful place for quiet, thought, and peace. The first time I’d been out to the Little Union cemetery since my Great Grandmother died many years ago was in November 2011. My brother-in-law Leroy and I rode out there to see the place that we’d been told we could use as a family plot. Daddy was not doing well, and it was only a week later that we were all gathered there again to say goodbye. The day that Leroy and I went out to the little country church cemetery was bright and sunny. After talking over the options, he and I walked it over. It reads like my family tree out there. For several years Daddy took care of the grounds in the summers. Just because. He had wanted to go back and whitewash some of the older gravestones, but he got so sick before we could do it. The stones out there for those who died during the War have different types of markers, a reminder of the limited resources of the time. Some names look like they were written by hand with a stick in wet concrete. I wonder if that is actually what happened. 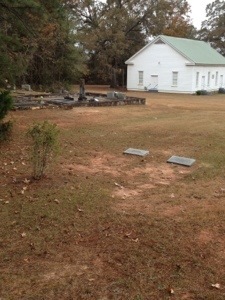 The precious church and cemetery out at Little Union. The family and I went out there on Sunday, as it marked the date that Daddy died in 2011. Two years. Our littles love going out there. Goodness knows we were out there a lot in the summer of 2012, watering the tea olive we’d planted at the foot of Daddy’s grave on his birthday in March of that year. We’d haul 8 gallon jugs of Blackberry Flats (the homeplace) water out there twice a week and cheer it on during the dry, hot summer. Their little faces turning red and damp in the heat of the day, they’d run around the cemetery reading names and exploring. They picked up turned over flowers and collected trash to dispose of later. They knew to be respectful and not walk on the stones and to leave things better than when you got there. And so this past Sunday, they went back to their adventuring after pausing a moment to let it soak in that there are two headstones there. I remember the discussion with Mama about putting another line on each stone. One word. That’s all I wanted. “Others” for him and “Loved” for her. But Mama was having none of that. Since I haven’t been out there with my hammer and chisel yet, their stones only tell names and dates, no indications of the beautiful lives they lived in between the two. Epitaphs used be to three words: “Mother. Sister. Wife” as an example. If you were writing your own Epitaph, what three words would you want to be your legacy and why? I was sitting here thinking about that tonight. I really couldn’t come up with three words. Or three separate thoughts. It’s hard to see yourself through the lenses of others, isn’t it? What would my family think appropriate? It delighted our Princess to see Papa or Mama on the stones and read them aloud. One she loved said, “Mama, Daughter, Beloved.” But what would they say about me? Hard-headed? True. Distracted? Ahem. Move on. Always running behind? I will come back and get y’all if you put that on there. I own it, but I sure hope that’s not my legacy. Death has reminded us once again in the past week that you just never know. And while there are no guarantees, I hope I have more time to work on my legacy. Maybe the three words that will stand out haven’t bloomed in me yet. As I was about to walk away from thinking and writing for a little while, hoping something would come to me, I heard the words, almost as though they were being whispered through a veil. Three words. A single thought. To cover my whole life–bumps and bruises and stops and starts, messes, successes, mixups, things done and left undone. All of it. I don’t remember the first time I heard it or whether it was Mama or Daddy who said it to me first. It was saved for the really special, choice moments in my life. Like when my oldest and first treasure was born in the wee hours of a Tuesday morning. Or each of my other two treasures born 9 and 11 years later. I think Daddy said it after I shared stories at my Great Aunt’s funeral in 2010, and Mama said it after the rush and chaos had settled following Daddy’s service. I don’t know that I deserved the words, but I do know my heart soared and I cried tears of gratitude deep inside my soul on those precious occasions when I heard them. I’m not ready to go yet, because I still have a lot of work to do to get to the point where anyone, especially my people, will feel like pulling out the hammer and chisel and putting this on my stone. But it’s good to have goals, and this is mine. To do good, and to be loved, and to love in a way that those left behind will forgive me my temper, my lack of organization, and all of my shortcomings. I hope they will forgive the stacks and stacks of books and bits of notes and cards and whatnot that I am loath to let go of, and in their hearts, they will be able to say those three words. She done good. It’s something to live for, isn’t it? For more epitaph thoughts and stories, visit Amy at her blog, “the reinvention of amy,” and read down to the links at the bottom of her post. Thanks, Amy, for a thought-provoking question this week! No one could expect more. If you hear those words in the voices of those who loved you, all the better. Thank you for stopping by and sharing. You are right. I am very lucky. This is lovely. I love the way you tell a story and what a great story to tell. Thank you for stopping by and reading. I appreciate your kind words. Great memories make it easier to write.